After a whole "sweetless week" I am in for a treat. And to my big surprise, it's a Liebster Blog Award given me by Ruth from Spring of a Curiouseed! Thank you Ruth! I was so thrilled: my very own first award! There was a big smile on my face (still is), a happy dance or a joyful swirl, a few jumps, and some other movements and sounds that usually accompany receiving of a good news. Liebster Blog Award is given by a fellow blogger to a blog (s) that have less than 200 followers as a gesture of recognition and encouragement. From what I've learned, Liebster blog in German means "favorite blog". It is very sweet and encouraging. 1. Acknowledge (comment) the blogger, that awarded you and link back to person's blog. 2. Nominate five blogs and let them know by leaving comments on their blogs. 3. Copy and paste award on your blog. 4. Enjoy this moment and spread the happiness around. I apologize if some of you don't want to play along. 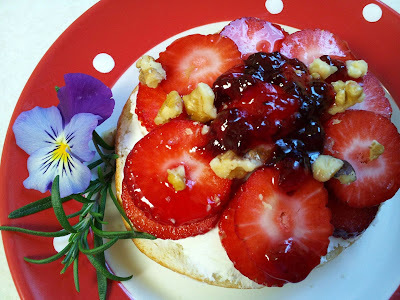 Another sweet treat of the day was my little desert: goat cheese and strawberry on a half of a bagel with walnuts and a black cherry jam. As I embarked on my next "sweetless week" journey, I indulge in every bite, murmuring from overwhelming pleasure. How sweet was your Sunday? Thank you very much for this, Marina! I'm very honored (and encouraged!) ^^ I'll be sure to get through all of this soon! Congratulation to you. Happy blogging! Mmmm, that bagel looks so yummy! I am following your award winners now, those are great blogs! Thanks for visiting my blog. Happy Monday to you too! Isn't it amazing how the less sugar you consume, the more sweet you find regular foods? I almost cannot even eat grapes anymore because they are so sweet. However, I always have room for strawberries. That bagel looks amazing!! Congratulations on your award - well deserved...I think your blog is terrific! ....and the bagel?! Goat cheese and strawberries? WOW! Just brilliant! Thank you Ann. You are so kind.